Plans have been submitted to demolish a derelict cinema in the centre of Brighton and replace it with flats and offices. Planning permission has already been given to knock down the distinctive grade II listed Astoria, in Gloucester Place, Brighton, and replace it with offices, a café and community rooms. But the owner Mike Holland has been unable to find buyers or tenants at a price that would cover the cost of the existing scheme. So he has asked Brighton and Hove City Council to agree to a new application which includes six top-floor flats and an extra floor of offices at the back of the building. His revised plans are for a six-storey building at the front, including a basement, with three storeys at the rear. A café and community rooms are proposed for the ground floor. He paid £2 million for the 80-year-old art deco cinema which became a bingo hall but the building has stood empty for many years. A report to councillors after Mr Holland’s previous application said that no organisation had been able to come up with realistic plans to renovate the Astoria. It estimated that a renovation project would cost at least £3.5 million and that the building was genuinely redundant. Mr Holland has previously renovated Stanmer House in Brighton and is still working on a revival of the Engineerium in Hove. 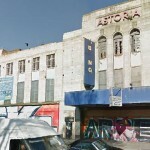 A decision on the latest plans for the Astoria is due to be made by the middle of March.